Out now is Il fiume del costante cambiamento (The River of Constant Change), a new Italian language Genesis book written by Mario Giammetti who is the editor of the long-running Italian Genesis magazine Dusk. 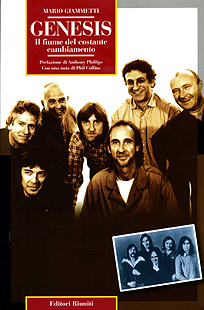 Featuring a preface written by Ant and a message from Phil Collins, the book also features a large number of rarely seen photos of the band and the band members - including one of Ant from 1977 supplied by yours truly. The book itself is split into two main sections. The first - I Dischi is written by Mario and tells the story of the band with a chapter based around each of the band's albums. The second Trent' anni Di Concerti is written by Mario's associates Mino Profumo and Alessandro Berni and chronicles the band's live shows over the years. Although I am not a fluent Italian reader, I recognise that the text has plenty of interesting details which have not been included in previous books on the band. Coupled with the rarely seen illustrative material which brings the text to life even further (Phil Collins' handwritten fax to Mario on his decision to leave the band being a great example), this makes for an informative and interesting read.